Camp Nanuq in Churchill, Manitoba. Today started out a bit slow, but soon got underway when we found Dopey again, our Polar Bear pal. This time he was perched up on a rocky ledge but still had his favourite bushes in clear sight. As we drove past the clump of bushes we stopped to inspect the roots to find out what all the fuss was about, but only saw the huge hole he'd been digging. He seemed disinterested in us today and didn't bother to move from his perch which was quite a distance away from the road, so we turned up a little side road not far from him to check out the scene there. We sat and scanned the area with our binoculars and when we turned around, who should be peering out from behind a rock but Dopey - curiosity got the better of him!! We turned off the engine to the truck and sat and watched for a while to see what he'd do. As it turned out, he was checking us out. Once he ascertained where we were, he got down from the rocks and walked over to his bushes, he obviously thought that since we'd stopped by the bushes there would be something new in there. Sorry to disappoint you Dopey but we're not in the habit of feeding wild animals! A typical saying here in Canada is "A fed bear is a dead bear"! We didn't want him to end up on the wrong side of the law! The problem was, since he didn't find anything he lost interest and started walking away from the area. Keeping our distance we followed him for a while until he made his way towards the shoreline of Bird Cove in Hudson Bay, we figured that would probably be the last time we'd see him. Finishing the usual driving circuit, we headed out to the research centre again to find some more action. There was none to be found out there! 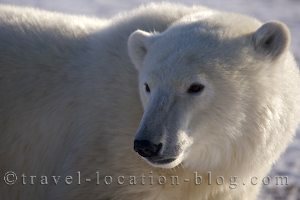 As we drove back along the road in the direction of town, we caught sight of a polar bear walking towards the main road - it was Dopey! He had walked a fair distance and was still walking at a decent pace - he looked to be on a mission. He approached the road, constantly sniffing the air and seemed undeterred by our truck plus a tour bus full of tourists who'd stopped to see him. Once he crossed the road right in front of us, we realised he was heading for a camp - the kitchen must've smelt mighty fine to him or someone had left some garbage out! At that point the driver of the bus drove up to us and told us he was going to send some crackers out towards the bear to deter him from the camp. This is common practice here, if a bear comes into town, around work buildings or a camp they use special cracker guns to frighten the bears away. When fired they make a very loud pop, whistle, and an explosion which sends the bear running away. Dopey certainly got a fright and ran but unfortunately not enough of one. After the bus had left, we decided to head up the road towards the camp because we had a feeling Dopey would be back - sure enough, the smell at the camp was just too good. Polar bears have a very keen sense of smell which leads them to their food, on the other side their eye sight is pretty poor. 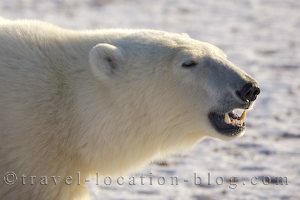 At this early stage of winter the polar bears are extremely hungry having not eaten in several months, and are anticipating the build up of pack ice in Hudson Bay to access their prey. We figured we should help in the situation, so we kept Dopey on the opposite side of the road from the camp. He came straight for the camp with his nose high, eyeing us up warily as he proceeded closer to the road. Unfortunately for him, we'd cut him off. He turned around and tried to go behind but we'd cut him off again. We played this tricky "game" with him for 30 minutes until some foolish tourists came along and cut in front of us. This presented a problem with us coming between him and the camp. Luckily Dopey sat down for a while to rest so the tourists became bored and left. Then Dopey suddenly got back on his feet and started trying the whole thing again - we backed up and cut off his access again. We wondered if he'd ever give up or if someone might come to our rescue. Luckily someone heard us, a local came flying down the road full bore in their truck which made the bear run, they reached into their back seat and grabbed a cracker gun and fired off a few shots in his direction - this time Dopey got the message and run back towards the shores of Hudson Bay. We could see he was starting to get frustrated with us constantly cutting off his access to the camp, so we were wondering if he might charge at our truck - he was a small bear (and was large) but I certainly wouldn't like to try that with a full grown adult bear! After chasing the bear away completely, the local came back to us and told us that she'd been in the garden and hadn't seen the bear heading her way - she just luckily heard the commotion we were creating, honking our horn and driving back and forth etc. I guess we rescued each other in the end! The last time we saw our old pal Dopey he was still walking away from the camp - hopefully he'd learnt his lesson and wouldn't try another visit when everyone has gone. After that bit of excitement, it was time to head home for the day, we were exhausted!